service of God’s kingdom was deepened and confirmed. theology at the University of Paris in preparation for the priesthood. to live lives of strict poverty and to serve the needs of the poor. Thus, what later came to be known as the Society of Jesus was born. I think the biograpn gives an excellent picture of St. Ignatius. In the short but well-written hagiography, his “setzen im leben”–his situation in life, when and where he lived–is made clear. Evelyn Underhill’s comment is helpful. 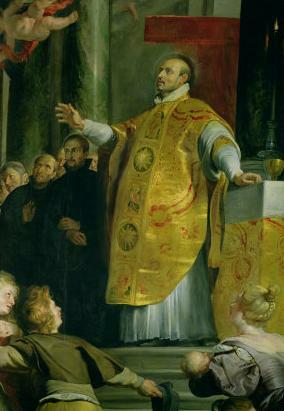 As we read about his understanding of himself, his conversion from a desire for “vainglory” to a seeking after the will of Christ, followed by a life of service and leadership not only in “corporal works of mercy” but in spiritual ones, we are helped to an understanding of why “Ignatian spirituality” is studied and practiced by so many today. New Hebrew reading: This seems to fit the commemoration well. Bio. Ignatius needs a ‘who he is’ and ‘why he is important’ statement. Michael–could you explain what you mean by the “who he is” and “why he is important” statement? It seemed to me the bio had all that in spades. I discovered the Spiritual Exercises over 25 years ago through Cursillo. I find them helpful to me and have reccommended them often over the years. Adding Ignatius to the list of Holy Men, Holy Women would be a real boost in promoting healthy spirituality in the Church. I am championing to have each bio begin with a ‘who s/he is’ and ‘why s/he statement. You know immediately who he is and why he is commemorated. Admittedly most church people will know ‘who and why’ Ignatius of Loyola is commemorated. But I think that the principle of having a ‘who and why’ statement for each bio is worth lobbying for. And, I am afraid that you will see my comment many times through this year of blogging re: HWHM. I’m not crazy about that “unschooled layman” sentence. Even if it reflects the period, we should know better than to say it that way. This is an odd feast for Anglicans, given that we also celebrate Latimer, Ridley, and Cranmer, thus giving us saints on both ends of the match at Oxford. (I know Ignatius wasn’t personally involved, but the order he founded was.) I suspose we have to keep him, but let’s give July 31 back to its traditional saint (Joseph of Arimathaea) and celebrate Ignatius on August 1. 1) Price and Weil (Liturgy for Living, 239, f.) write, “The men and women dignified by black-letter days [i.e., the lesser feasts] are not called saints. There is no procedure in the Anglican communion (sic) for recognizing sainthood. We have, on the whole, preferred the New Testament understanding of a saint as any Christian believer. “The saints who are at Corinth” is for St. Paul synonymous with the Christian congregation at Corinth. In the Old Testament the saints are Hasidim, those who belong to the covenant people and are bound to God and to each other by the covenant loyalty (hesed), which God requires of us and himself gives. All baptized Christians are saints in this sense. Black-letter days, then, commemorate not saints, but great persons in the Christian tradition. . . . QUESTION: Noting especially the discourse in this blog, is this still a reasonable statement of our belief, terminology and practice regarding the lesser feasts in the Episcopal Church, namely, that we don’t use “saint” for those commemorated on minor feasts? QUESTION: Similar to the question above — is this still a reasonable statement of our belief and practice regarding the major feasts in the Episcopal Church, namely, that we do use “saint” for those commemorated on major feasts? QUESTION: It’s obvious that this norm no longer applies. Are there ANY guidelines besides those in the back of HWHM (742, ff.) to assist in judging what contributes to a meaningfully constructed calendar, or (just as important) what may be edifying but not optimally fit for inclusion in the official calendar? COMMENT: Every parish knows of baptized Christians whose lives are quietly heroic, or even not-so-quietly outstanding in terms of faithfulness, devotion, prayer, and all the rest. Surely, not ALL should be included? 4) QUESTION: Are we working towards a goal of any sort? For instance, an optional commemoration for every day in the year? A distribution according to constituencies previously neglected? An ecumenical representation (and if so, would there be any criteria of unacceptability by religion, by practice,or by idiosyncratic creedal anomaly)? 5) QUESTION: Does it make sense (or even, has it been agreed) that having MORE THAN a single optional observance for a given calendar day is an acceptable working norm for this kind of book? COMMENT: I don’t like THAT shade of blue. Thanks, Steve Lusk, for the historical reminders. I had stupidly assumed that the Counter Reformation took place after the deaths of the major Protestant reformers like Cranmer, but I see now that Cranmer and Ignatius were almost exact contemporaries (Cranmer 1489-1556, Ignatius Loyola 1491-1556). Loyola’s Society of Jesus (Jesuits) was approved by the pope in 1540. Steve–can you tell us more about the role of the Jesuits ini the trial and execution of Cranmer? –It does indeed seem ironic that we honor both Cranmer and Loyola, a leader of the Counter Reformation, which made some reforms we all would think were needed (better education for priests, less absenteeism, etc.) but also tried to undo what Cranmer was doing theologically. Two things Cranmer and the Counter Reformation, starting with the Council of Trent (1545-1563) disagreed on were the doctrine of salvation (for Cranmer and Luther it was by faith; for the Counter Reformation, it was insisted that faith and to be accompanied by works, which to many Protestants then and now seemed like Pelagianism) and Transubstantiation, which Cranmer died preaching against. How DO we reconcile this honoring of a person who founded a society which executed the person most responsible for the foundations of Anglicanism, with honoring our own Cranmer as well? Thanks for your response, too. On further checking, it was actually a Dominican friar, Juan de Villagarcia, who played the good cop role (as opposed to the torturers’ bad cop) in the interrogation of Thomas Cranmer. But Jesuits played prominent roles in Mary’s attempts to reimpose Roman Catholicism and in Papal and Spanish efforts to foment rebellion against Queen Elizabeth. Perhaps Foxe’s Book of Martyrs needs to be more widely read in seminaries, if only as a corrective for those who insist that we are not now and never have been a Protestant church. One of the glories of our church is that we don’t try to reconcile these differences, at least not with regards to the Reformation-era saints. We honor their contributions and discount those of their failings that can be attributed being people of their own time. Interesting. About Seabury–I very much enjoyed Bp Marshall’s _One, Catholic, and Apostolic_, which used primary sources to show what Seabury’s real contributions were. For instance, if I remember the book right, Seabury insisted important early decisions couldn’t be made without a bishop on board (seems like a good idea to me) and that the first American BCP be less “liberal” than those who wanted it to be in order to please people like Benjamin Franklin and John Jay. In other words, it wasn’t that Seabury was “high church,” it was that he believed in the creeds (the more liberal thinkers didn’t want to emphasize Jesus’ divinity) and he believed in what seemed to me a more Cranmerian Eucharistic doctrine than the more liberal thinkers wanted. My impression was that the compromises he and Bishop White (that is, the first bishop of PA) achieved were good for the church. I’d like to see his commemoration mention some of that. I just want to say thank you for the continued discussion about Ignatius of Loyola. Being a cradle Episcopalian, coming from a low-church background, and descended from a family deeply steeped in Reformed and Calvinist theology, I cringe each year when we get to Ignatius of Loyola. I never quite understood how he came to be included in the liturgical calendar. So the discussion is very enlightening. It may be a bit late to mention this, but Loyola wasn’t a “monastic,” but rather a “religious.” He didn’t live in a monastery and had an active ministry outside of anything like a cloister.